Panna Cotta is a classic Italian dessert which is easy to make and is elegant. I had been wanting to make Panna Cotta for quite some time now and was looking for the right time. 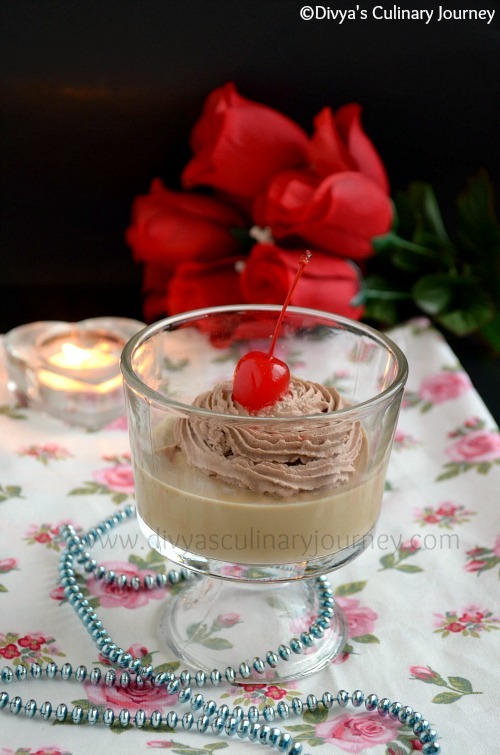 Today being my blog's second birthday, I wanted to prepare something special so I prepared this Espresso Panna Cotta with Cocoa Whipped Cream. This is light dessert with silky smooth texture and a rich coffee flavor. The Cocoa whipped cream adds to elegance of this dessert. This dessert is very easy to prepare and took just minutes to prepare, though the time taken to set was around 2-3 hours. My site has lot of easy to make recipes with which even the beginner can cook like a pro, then what dessert can be more apt to celebrate my blog's birthday than this easy to make yummy dessert. In a sauce pan, add milk and gelatin and keep it aside for 5 minutes, so that the gelatin softens. Then place the sauce pan in medium heat and stir it till the gelatin dissolves. Don't bring it to boil. Now add the heavy cream, sugar and instant espresso powder and stir till the sugar is completely dissolved. Remove from the heat and let it cool lightly. Now pour this into the desired serving bowls and cover and refrigerate for about 2-3 hours or until set. Mix heavy cream and cocoa powder and whip the heavy cream mixture till it thickens then add confectioners sugar and continue to whip till stiff peaks are formed. 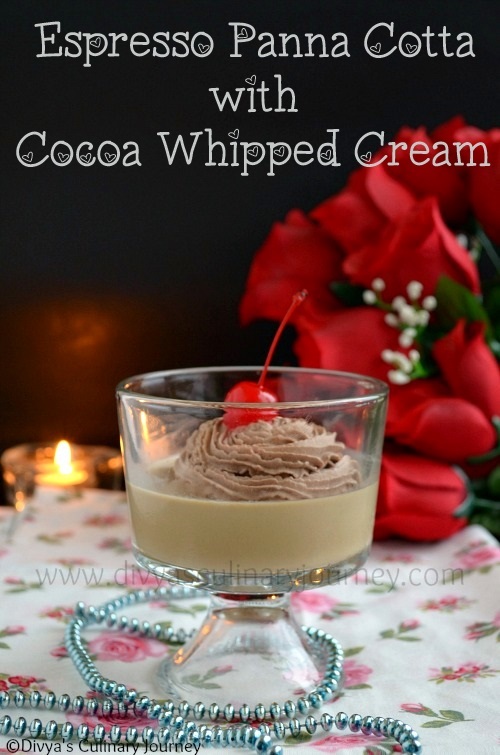 Serve this cocoa whipped cream on top of the set Panna Cotta. I used piping bag and star tip to pipe the whipped cream on top of the Panna Cotta. To decorate it I placed a cherry on top. You can also add shaved chocolates for decoration. Depending on the serving bowl size, number of serving varies. Use a serving bowl, that can hold at least 3/4 cup of liquid. Then you will need 2 bowls. Divide the mixture equally between the 2 bowls, which makes 2 servings. That's what I followed. You can add in smaller bowls for smaller servings, then time taken to set will come down. If larger bowl is used for larger serving, then time taken to set increases. You can double the recipe easily. Hearty Congratulations! Happy Blog Anniversary dear!! Wishing You many more years of blogging! Hoping to see such many more delicious recipes from you!! 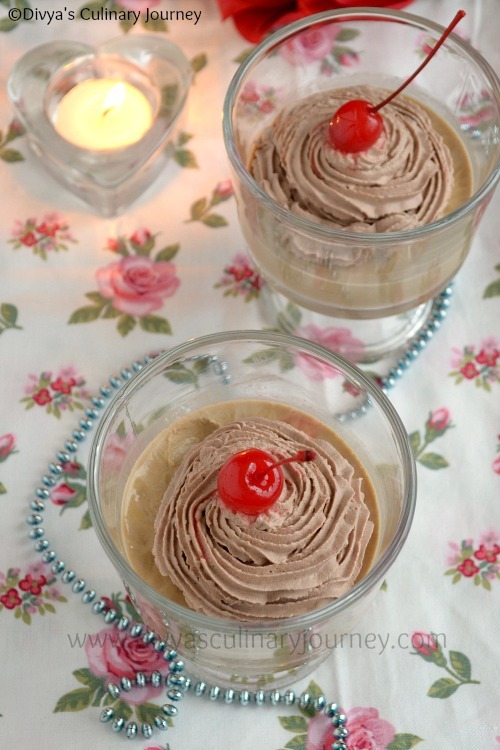 That's one delicious treat, perfect for the occasion..Choco Panna cotta looks absolutely delicious with my fav choco whipped cream...too tempting :) Well done Divya! Happy Blog Anniversary Divya. Yummy pannacotta. Very inviting clicks. YUM! I love Panna Cotta and your recipe looks divine. I'm pinning to try at a later date! Happy Blog-versery! Happy Blog Anniversary! May you have many more wonderful years to come! And your panna cotta looks incredible! This is a lovely dessert, looks delicious.